Thought this would be a good opportunity to show off the 2.5 Affliction I made up. I know some people are already using it. Other than that he is a pretty straight forward build. I hope to get a few more characters up now, mainly for my own enjoyment and as models for people to use as 3 ed. 1610 builds. As usual I used the OHUMU. Also in issue 49 of Ultimate X-Men, Sinister manages to avoid Prof. Xavier's mental manipulation. He instead controls Charles. I think he won initiative and Charlie failed his save. Last edited by Cinder on Sat Dec 10, 2011 5:24 pm, edited 1 time in total. I decided I liked what they did with Venom in the Ultimates 3, thus the growth and the tendrils. It seems like he has a vulnerability to electricity. If anyone disagrees let me know. Used the OHOTUMU to get the strength and other stuff as usual. It seems that Venom must eat or the suit consumes Brock. Added the suit. It is a 123 point power suite that one can apply to any character. This is the suit after it has bonded with Peter. 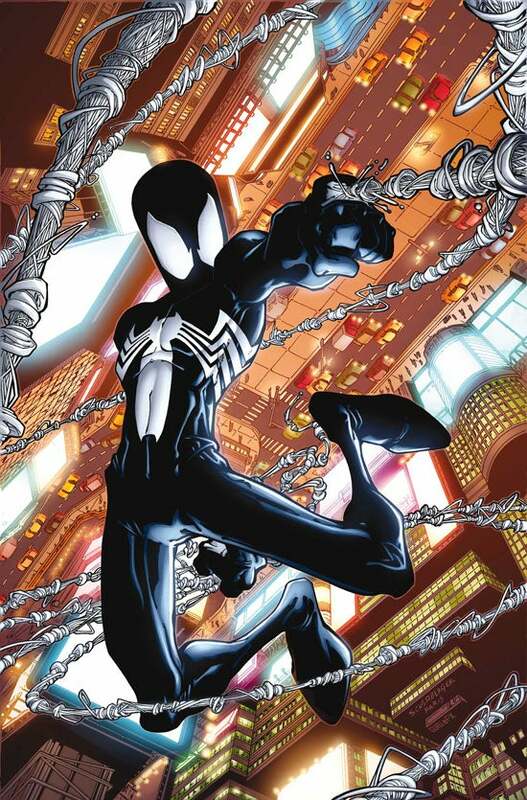 It is conceivable that another suit built by the elders Brock and Parker could/would grant different qualities or abilities based on the wearer it bonded to. I always saw it as the suit bonded with Pete, so that is why it developed a spider motif and group of powers. Last edited by Cinder on Sun Jan 29, 2012 11:29 am, edited 1 time in total. Eventually, Matt’s father became caught up with the crime boss, Wilson Fisk. Unbeknownst to Jack, Fisk had bookies working the boxing circuit. Fisk, through these men, began arranging matches in favor of an unwitting Jack. In this way, Fisk built Jack up as a heavyweight contender and, as Jack was the perpetual underdog in his fights, made a mint on him through his network of bookies. Despite his career of choice - or, perhaps, because of it – Jack impressed upon Matt the value of an education, and pushed him toward his studies, driving him to be more and more successful in his education. Though Matt loved his father and excelled in his studies, he harbored some resentment towards his father as a result of the neighborhood bullying that accompanied such success. As a result of his spurning childhood games in favor of his studies, Matt gained an unfair reputation for cowardice. The local children labeled him, derisively and sardonically, as the ‘Daredevil.’ Needing a release for the frustration it built within him, Matt began to secretly train in his father's gym. Despite this, Matt continued to lead a fairly normal life, until, one day, fate intervened. A blind man began to cross the road, unaware that a garbage truck was bearing down on him. Matt altruistically moved to save the man by pushing him out of the way. The truck swerved, losing some of its cargo. One piece of the cargo, containing radioactive isotopes, struck Matt across the face. As a result of the accident, Matt tragically lost his sight. However as he regained consciousness, Matt found that in place of his lost sight, he had gained a super-human level of enhanced non-visual senses. Eventually, Fisk arranged Jack’s title shot. As a result of Jack’s string of wins, he had long since lost his 'underdog' status; he was now the clear favorite. Fisk approached Jack telling him that he must throw the match. Jack was confused and ashamed that his streak was a fix and refused. He won the fight by knockout and was murdered for it. Now orphaned, Matt sleepwalked through his formative years. While he still managed to get high grades, he could no longer see any point in such pursuits. Matt lacked purpose, until he met a man named Stick, a martial arts master, who would train him to make true use of his abilities. Matt’s new training did not, in his mind, invalidate the promise he had made to his father to make something of himself. He graduated college and enrolled at Columbia Law School. There he met a woman named Elektra Natchios. They dated for a time until a string of violent occurrences at the school tore would prove to tear them apart. One of Elektra's friends, Melissa ‘Mel’ Beckerman, was raped by a rich and connected student named Calvin “Trey” Langstrom III. Despite Beckerman pressing charges, Langstrom’s father used his influence to cover up the incident. Unable to accept the cover-up, Elektra resolved to confront Langstrom. On a mission to threaten Langstrom, she encountered Matt in disguise. Despite Matt’s interference, she went through with her plan to threaten Langstrom. This only resulted in more pain for her friends and family, as he responded by hiring thugs to burn down Elektra’s family business. Matt managed to discover evidence that revealed the arsonists connection to Langstrom, having him arrested again. The charges were once again dropped. Deciding that Langstrom would never stop, Elektra manipulated him into a confrontation. Matt learned of her plan and, in disguise once again, intervened. Trying to stop Elektra from crossing the line and killing Langstrom, Matt revealed his true identity and powers. Unfortunately, rather than making her trust him, Elektra viewed his lie of omission as a betrayal. Elektra cut Langstrom’s femoral artery and fled, leaving Matt a choice; go with her, or save Langstrom’s life. Matt chose his conscience and saved Langstrom effectively ending his relationship with Elektra. While Elektra withdrew from the college, Matt stayed on and eventually, his friend, Franklin 'Foggy' Nelson, and he had the opportunity to intern for renowned lawyer William Savage. Elektra’s and Matt’s paths soon crossed once again. Elektra in a desperate attempt to help her father recover the family business turned to her cousins Paul and Leander Natchios. The Natchios brothers used the business to launder money. After a time, the brother’s bookkeeper, decided to betray them. He stole their ledger containing information on not only Paul and Leander, but the Wilson Fisk and others. When Fisk learned of this he confronted Leander. He told him that he must recover the ledger or forfeit his life. Elektra saw this development as a way to have her father released from his obligation to the Natchios brothers. Leander agreed to release her father if she recovered the ledger. Fisk did not trust Leander, and sent an assassin of his own to take care of the bookkeeper. Benjamin Poindexter, also known as Bullseye, was that assassin. Both he and Elektra tried to steal the ledger at the same time. Bullseye killed the bookkeeper and very nearly Elektra. He then left an anonymous phone call, intending to frame Elektra for the bookkeeper's murder. Instead, Elektra’s father was arrested for the crime. Despite the rift between them, Elektra called on Matt to help clear her father’s name. As luck would have it, William Savage was also the bookkeeper's lawyer. Savage had a second copy of the ledger, as well as a series of incriminating documents and tapes. Savage foolishly tried to profit from returning this evidence to Fisk. Fisk responded by having Bulls-eye kill the lawyer. Elektra managed to get the ledger before Bulls-eye could, and double crossed Matt, knocking him unconscious and leaving with the evidence. She gave the ledger and the rest to Fisk and in exchange he arranged for her father to be exonerated. Later, Matt confronted her once more. Having run through what was left of Savage's notes and tapes, Matt told Elektra about them. He told her that they alone would have been more than enough to clear her father's name and that she could have saved him without selling her soul to Fisk. Having stolen both his father from Matt, and as far as Matt's concerned, Elektra's soul, Matt's made it his life's work to take down the Kingpin and to keep Hell's Kitchen safe. Over the course of his career, he has encountered Spider-Man multiple times. One such occurrence happened while he was pursuing the killer vigilante known as the Punisher. At this time, Matt, grizzled by his time as a hero, dismissed Spider-Man as too immature to be a crime-fighter. Months later, Daredevil reluctantly teamed with Wolverine and Spider-Man to protect Hell’s Kitchen from rogue Weapon X agents. Still later Matt meets Spider-Man, Shang-Chi, Moon Knight, Doctor Strange and Iron Fist and agrees to be part of the “Knights.” However, Iron Fist tells Fisk about the group’s plans in order to protect his family, who Fisk has threatened. Moon Knight creates the Ronin persona and poses as Fisk’s bodyguard. This persona becomes dominant and attacks Midtown High School, incapacitates Kitty and knocks out Spider-Man, taking him to Fisk. Fisk tells Spider-Man that Daredevil is his informant. Believing Fisk, he accuses Matt. However, Matt refutes this and uses his heightened senses to pin-point Iron Fist as the informant, which he admits. Later the group manages to distract Fisk, so Matt has time to slip into his wife’s bedroom. Fisk enters the room only to see Matt holding his comatose wife. Matt angry at all Fisk has taken from him, threatens to kill her. Spider-Man somehow persuades Matt to release her, but he and the other Knights order Fisk to permanently leave the country. Meanwhile, Moon Knight is shot in the head and left to die in a river, but he manages to survive through his alter-egos and turns himself in, implicating Fisk. As a result Fisk is finally brought to justice and arrested. Sometime later Matt represents Bruce Banner in his murder trial. Although Matt loses the case and Banner is sentenced to death, he tries the case well. Last edited by Cinder on Wed Dec 26, 2012 2:04 pm, edited 1 time in total. Additional Note/Edit: Dazzlers powers received a retcon in Ultimate X-Men #84. There Bishop revealed that her powers worked completely differently from Earth-616 Dazzler. Instead of converting light into sound, Bishop revealed that Allison's light abilities were actually just a side effect of her real mutant power, the power to split molecules. Ali had created light by causing tiny explosions that split air molecules. The following represent those powers. Which you use are up to you. Last edited by Cinder on Wed Jan 25, 2012 5:39 pm, edited 3 times in total. The X-man known as Beast, AKA Hank McCoy, suffered a difficult childhood. He was an awkward child with a genius IQ and while these characteristics alone might have set him apart from his peers, his luck proved even worse, and his genetic mutation caused him to develop an almost ape-like appearance. The other children taunted as him; calling him, among other clever names, “Monkey Boy” and “Joe Bananas” When the truth of his mutation could no longer be denied, his parents rejected him as well. He is a founding member of the X-Men and the team's elite scientist/engineer. As a technical genius, he frequently upgrades the X-Men's Blackbird and Danger Room sequences. In his late teens he was recruited by Jean Grey (Marvel Girl) and dubbed Beast, becoming a founding member of Charles Xavier‘s X-Men. He helped rescue Bobby Drake (Iceman) from Sentinels in Times Square and fell in love with his team mate Storm, though low self-esteem prevented him from openly expressing it. When the X-Men battled the Brotherhood of Mutants in Croatia to rescue the U.S. President’s kidnapped daughter, Beast was critically injured. A revolutionary transplant technique saved his life, but a side effect turned his hair blue. In spite of this close call, he soon returned to action when Magneto led a Sentinel attack on Washington, an attack that ended in Magneto’s apparent death. Beast and Storm began a relationship, though Henry’s self-esteem issues remained a problem. Sometime later, when Beast was captured by Weapon X, Dr. Cornelius enhanced Beast’s animalistic qualities leaving him with blue fur, claws and fangs. Even more insecure about his looks, Beast began an online correspondence with “Naomi” who was later revealed to be the screen-name of the Brotherhood’s Blob. After rogue telepath David Xavier claimed his father Charles had made Storm fall for Beast in order to keep Hank in the school, Beast shut Storm out, fearing it was true; he increasingly confided in Naomi, eventually revealing Magneto’s survival. When out on what he thought was a date, the Brotherhood ambushed Beast, forcing him to disclose Magneto’s whereabouts. With Magneto’s return, the general public blamed the X-Men. They became fugitives, who were hunted by the authorities and eventually forced to battle the Ultimates. They finally redeemed themselves by recapturing Magneto and preventing him from destroying Florida. With the X-Men recognized as heroes, Hank was shocked to find his parents now accepted him, though he realized they merely wished to cash in on his newfound fame. Renewing his relationship with Storm, Beast continued to be active on the Internet, carelessly discussing the X-Men’s angelic new recruit Warren Worthington on his fan website. When religious demonstrations ensued, Hank’s teammates berated him for his foolishness. Feeling insecure again, and aware of the handsome Warren’s attraction to Storm, Beast quit the X-Men after he was approached for Emma Frost’s new mutant spokesperson program. At the group’s public unveiling, a rogue government faction released a Sentinel; while trying to get others to safety, Beast was struck by debris and killed. He was buried in the Xavier Mansion grounds in a private ceremony; his parents did not bother to attend. However, it is eventually revealed that Beast did not die in the attack. Shortly afterward, in the hospital, doctors were able to revive him. But before the X-Men were notified, Nick Fury and Professor X stepped in and transported him to the Triskelion, where he was to work on finding a cure to the Legacy Virus. Professor X psychically convinced Hank that the X-Men knew he was alive and well, though they in fact believed him dead. After the Professor’s apparent “death,” Beast learned the truth, and became upset at Nick Fury for lying to him. However, he still resides in the Triskelion, still presumed dead, researching and experimenting. One of these experiments resulted in Beast’s hair and skin to return to its normal pigment, instead of blue. *Note: This is the first time Beast reappears after his death is faked. At this time he is shown to have cured himself of the blue fur problem. It could have happened any time in these two years. Last edited by Cinder on Fri Sep 14, 2012 9:36 am, edited 1 time in total. Nick Fury disappears on May 19th 2010. After this happens, SHIELD promotes Carol Danvers to Acting Director. What happened to the man that some call the most powerful in the world? • In the Ultimate Power series (available at a comic shop near you!) Fury was forced to go to another dimension, that of the Squadron Supreme, to answer for he and Reed Richards' mistakes. Are your heroes asked to help the mission to another dimension? Are they asked to keep the peace while the other heroes are away? • Has Fury been kidnapped by a terrorist organization? Only your heroes can save him! • Fury contacts your heroes to help him on a mission so secret that he cannot even tell his own subordinates at SHIELD. • Fury's body is found in your heroes neck of the woods, he was killed violently and SHIELD wants you to help find out why. The Hellfire Club was killed by Jean Grey manifesting her Phoenix powers for the first time on November 12th 2008. They died during a ritual and were burned to ashes. • The members where killed, but the purpose of the ritual was not to control the Phoenix. On the contrary the ritual was meant to grant them Phoenix-like rebirths. Those killed arise again, but in their new forms they now have mutant powers. Your heroes find out that the club is now out to take over the world unless they stop them. • The members where killed, but the purpose of the ritual was not to control the Phoenix. On the contrary, the ritual was meant to set in motion a series of event that release the "true" Phoenix from its prison in the center of the Earth. Your heroes must stop the other club agents before they bring about the escape. • The members were not killed. They used ancient spells to hide their existence from the god-like Phoenix entity. In its hubris it did not notice them. Happy that the Phoenix has manifested, they now attempt to control it. To do so they are acquiring items from around the world. Your heroes must stop them, because if they can achieve the control of the Phoenix, nothing will be able to stop them. • The members were not killed. They used ancient spells to hide their existence from the god-like Phoenix entity. In its hubris it did not notice them. They are now searching for another child that may have the same connection to the Phoenix that Jean Grey did. If they can find the child they can manipulate her into killing Jean and taking over the world. Doug Ramsey, on several occasions has felt rejected by the other students at the Academy of Tomorrow. • As a result, Ramsey uses his considerable intellect to create a process that will transform him into an altogether new being, one that combines both science and nature. A side effect of his transformation is that he has loses all empathy for the human race. He decides that homo sapiens and homo superiors are inherently flawed and decides that the entire population of the earth should undergo the same rebirth he has experienced. • As a result he wishes that he also had powers, so that he could be more accepted. He is scavenging for parts in a Chicago junkyard. There he finds a small piece of advanced technology. He is fascinated by it and brings it home. What Doug does not know is that it is all that is left of the Technarcy that the X-men defeated on January 9th 2010. He gives the remnant a power source and it regenerates. However it is far too damaged to make itself complete. The alien communicates with Doug offering him the chance for power. When he accepts they form a symbiotic relationship. Doug now sharing the thoughts of the alien seeks his revenge. He decides to destroy the Academy. He defeats them by going after them one by one. Then he sees a news report concerning your heroes. He decides they are a good challenge and goes to defeat them. • Doug is only feigning his desire to be part of the mutant world. In fact he hates mutants and is merely studying them to learn their weaknesses. He reports to a handler in the Friends of Humanity. Your heroes learn that he is a spy for the organization. When the try to bring him to justice, his classmates see the heroes attacking their friend. They attack the heroes to protect Doug. Can the heroes convince them that Doug is the threat? • Doug actually is a mutant, but his powers have not manifested yet. When they do he falls into a comma. His power is the ability to communicate with technology. His unconscious mind is wreaking havoc on all the computers and machines and society is near collapse. Can your heroes figure out what is causing the phenomena and find a way to stop Doug before he does even more harm? Magik has just killed one of the men that killed her parents and kidnapped her brother. Note: these can be really good for X-Men campaigns, but can work for other groups of characters too. • Several more of the men responsible, including the leader Maxim Titov, are still out there. Titov fled to your heroes' hometown after he heard about his comrade. She has come to town to take her vengeance. Can your team stop her? • Colossus is making a speech about mutant rights in your heroes town. Mystic resents Piotr for abandoning her and means to take her vengeance out on him as well. She begins by taking control of him. She forces him to attack bystanders and Police in an attempt to ruin his reputation. Can your heroes stop both Colossus and Magik? • A beautiful blonde girl with a giant sword teleports into your heroes' base. She is severely injured. She utters only one word before she passes out, "Demons." Can they find out who she is and what is going on, before whatever it is that chased her here finds her? • A man with one arm shows up and tries to convince your heroes that a crazy girl as stolen his magic artifact. In fact the man is an ageless Belasco. Do the heroes find out in time, or do they end up doing the "wrong" thing by defeating Magik and turning the bloodstones over to him? The Kingpin's wife is in a comma. He learns of a mutant with a healing factor. The heroes must protect the mutant from the crime boss' attempts to use the mutant's genes to heal his wife. The Kingpin wishes to broaden his empire beyond New York. The criminal bosses in the heroes' city are fighting against his expansion into their territory. The Punisher comes to town because their gang war is harming innocents. The heroes have to deal with both the Punisher and the criminal elements. The Kingpin has fled NYC after his legal trouble and is holed up with crime lords in the heroes' city. He is forcing them to cause a crime wave to get as much money out of the city as possible before he is forced to flee the country. The heroes must protect the city from a carpet-bagging Kingpin.